TUESDAY, Oct. 30, 2018 (HealthDay News) -- If you insist on dressing your pet in a costume for Halloween, Fido will thank you for doing so in a safe and comfortable way, veterinarians suggest. "Make sure costumes are the appropriate size and fit for the pet. A costume that is too tight will be constricting and uncomfortable, and a costume that is too loose may rub and cause skin irritation; in either case, the pet may have difficulty moving around and will not enjoy their experience," said Leni Kaplan. She is a clinician at Cornell University's Hospital for Animals. "Costumes with accessories that are easy to grab or pull off are not recommended; a pet might eat the accessory predisposing them to a gastrointestinal foreign body obstruction, which will require veterinary medical attention and possible surgery," Kaplan warned in a Cornell news release. Katherine Houpt is professor emeritus of behavior medicine at Cornell's College of Veterinary Medicine. She suggested if you're planning to dress up your pet, "make the costume a signal that good things are about to happen, like a walk. Another method is to pair a tiny, but delicious snack with the placement of the costume." Costumes aren't the only thing you need be careful with: Halloween candy may be a treat for you, but could be dangerous for animals. Kaplan explained that, for pets, "candy and human snacks can lead to vomiting, diarrhea, dehydration and, in some circumstances, pancreatitis -- a serious illness which may require hospitalization. Restrict access to chocolate, coffee, caffeine, macadamia nuts, grapes, raisins and any food containing xylitol or psychoactive cannabinoids, such as marijuana." It's also probably a bad idea to take your dog trick-or-treating. "It is not advised to take your dog trick-or-treating -- due to crowds, children, unfamiliar people dressed in unfamiliar outerwear (costumes, masks, and carrying props). Dogs who are normally fine in crowds may be scared or spooked, and may act aggressively or out of character," Kaplan said. "If you do take your pet trick-or-treating, make sure to dress your pet in brightly colored and reflective clothing so they are easy to see at night, and keep them on a leash at all times," Kaplan added. Halloween decorations can also pose risks to your pet, the vets added. "Pumpkin is safe for pets to eat as long as it is not moldy. If your pet eats moldy pumpkin, contact a veterinarian immediately," Kaplan said. "Avoid using real candles, as pets are often drawn to the flickering light and warmth. They could burn themselves or start a fire if the candle or Jack-o'-Lantern is tipped over," she noted. "Instead of candles, use battery-powered LED candles or glow sticks. Make sure your pet cannot access and eat the LED candles or glow sticks." 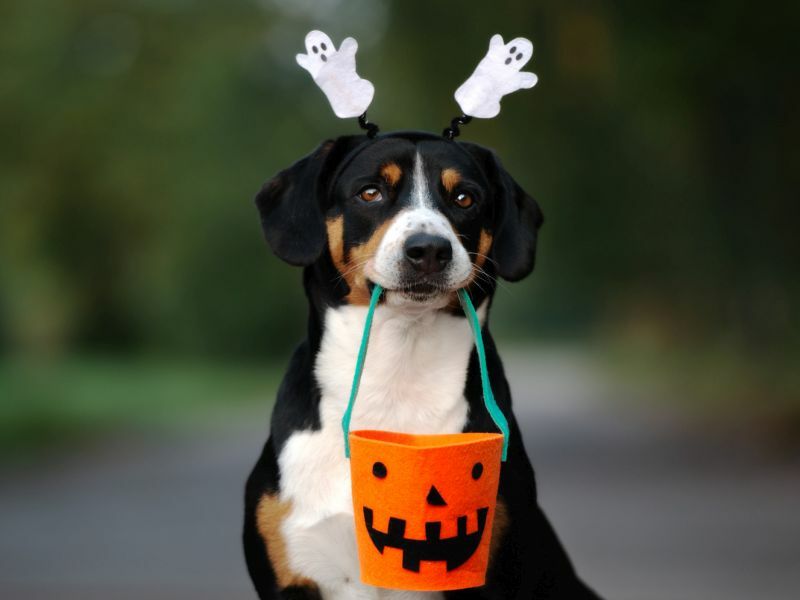 If Halloween hijinks are too much for your dog, take steps to keep your pet calm. For example, Houpt suggested, "During parties or trick-or-treater visits, dogs can be confined in a room with a long-lasting treat or a food-dispensing toy. Play loud music or white noise so the dog is unaware of the people."